I don’t often fish cables through walls but when I do I want everything to look nice. That’s sort of the point of having hidden cables. So, when I feed the wire out I use one of these wall bushings. There’s only one problem. Half the time they fall out. 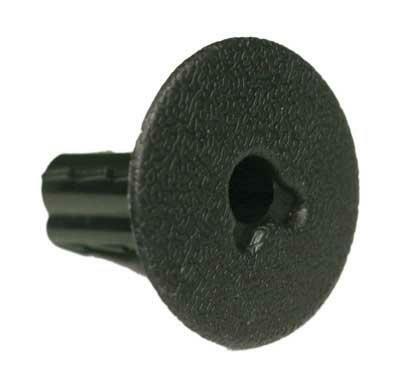 Wall bushings are supposed to grip the drywall like toggle bolts and hold on tight. But sometimes in older drywall the hole just gets kind of crumbly and then the bushing falls out. At this point it’s hard to know what to do. I personally find that a tiny little bit of wood glue will hold the bushing in place forever. You don’t need anything stronger than that. The only problem is that you could pull up some paint when or if you take the bushing off. Personally I don’t think that’s a really big deal. Why? Because if you’re taking that bushing off you’re going to be left with a whole that needs patching anyway. So you’re going to need to do repairs no matter what. If you’re using a bushing like this outdoors you should absolutely be using some sort of outdoor caulking. This is especially true if the bushing is over stucco because you’re not going to get a firm, air-tight seal. Personally I would put caulk under the bushing and also a little bit of it around the cable to try to make things especially water tight. This is going to make the cable stay in place instead of having a little play so make sure there’s enough loose cable on the other side. Folks, I don’t recommend using construction adhesive unless you are going to leave something in place forever. That’s sort of the point of construction adhesive. It’s designed to go on and STAY on. If you glue something down with construction adhesive it’s going to stay on there forever and when you try to take it off it’s going to rip a big old hole in the drywall. I know I said I’m not against patching a small hole but you don’t need to be making an even bigger hole for no reason. Really it is going to depend on how the bushing is used. I tend not to want to use caulking indoors unless I need something to be watertight. On the other hand it’s a must if you need water resistance. I would just say use the gentlest adhesive you can because stronger adhesives are going to cause more damage when you eventually remove them.